Sure, you could always cook over an open fire, but that’s not exactly the most efficient way to feed a group of people. A camping stove is the perfect blend of modern convenience and roughing it. Camp stoves are perfect for smaller outdoor cooking jobs such as tailgate parties, hunting, camping, or even a backyard cookout. 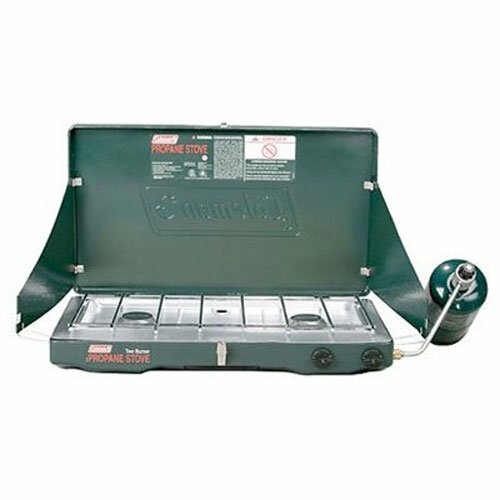 The Coleman Classic Propane Stove has been a beloved feature of camping families for decades! If you’re in the market for a camp stove, you’ll want to know more about this one before you make a purchasing decision. Summer is a time for camping and exploring the good old outdoors! Whether you’re engaged in a day of hiking, swimming, or mountain biking, the energy you burn when you’re in nature gives even more importance to the food you eat. And finally we’ll provide a sampling of actual customer and Independent reviews to give you better insight into the product. Windblock Side Panels. Nothing is more frustrating than getting your camp stove lit, only to have it blow out from the wind! The Coleman Classic Propane Stove has side panels that fold out or in (depending on the size of the pan) to block the wind and keep your burners lit. Two 10,000 BTU Burners. Flames on these separate burners have independently adjustable flames, meaning that you can cook your pancakes on low heat in one skillet while frying up the bacon on higher heat in a different pan. Long Lasting Fuel Usage. Maintaining environmental friendliness, this Coleman camp stove uses Perfect Heat technology to reduce the amount of propane fuel you use. In fact, with both burners cooking on high, a single 16.4 ounce propane cylinder will last for up to an hour or more. This means you should have enough fuel to accommodate cooking for a whole weekend. No Integrated Lighter. Many camp stoves have a Piezo ignitor that works to light the gas. For this one, you’ll need to be sure that you bring along a lighter or matches of your own. Control Valves. One of the most common points of constructive criticism from reviewers is a sticky control valve. One reviewer found that this was easily fixed by cleaning the inside of the valves and applying lubrication. Difficulty Adjusting Burner. Another concern for a few users of this camp stove was that, although the knobs turn as they should, the burners do not adjust well enough. Some people found that their burners were either full blast or very low, with nothing in between. The majority of users did not report this as a problem, though. Made in China. Although Coleman is an American company with headquarters in Wichita, Kansas, the majority of good are now manufactured in China. Some people feel the quality of the company’s products has decreased since this change happened. The Coleman name is almost simultaneous with camping. Trustworthy and reputable, Coleman has been in business for more than 100 years, with product lines that include lamps, coolers, airbeds, and almost anything else you might need in the way of camping and outdoor equipment. In more recent years, the original company has been sold to other parent companies, which may mean that the name brand doesn’t carry as much weight as it once did. Still the company is an American company that functions as a leader in camping gear and equipment. Looking at the features and benefits is great, but taking a look at what real-and-actual customers have to say about a product offers a deeper dive of insight. Here we’ve curated reviews that reflect the Coleman Classic Propane Stove, providing feedback from product users and reviewers on independent review sites as well as on Amazon. Rated year-after-year consistently with good reviews on Amazon, this camp stove comes highly recommended. One verified purchaser calls this stove a “must have” in areas where electricity is limited or residents experience frequent blackouts. 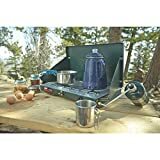 This reviewer notes that set up was easy when the product arrived and, even though it was cold and windy, water boiled on the Coleman camping stove in about eight minutes. Shutting the stove down after use is also easy, packing it up after letting it cool. 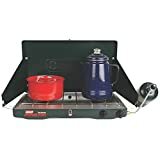 A different Amazon verified purchaser mentions that he used this stove for every meal and, with one propane canister lasting for the whole week. He mentions that it is necessary to bring along your own matches or lighter. Even in freezing temperatures, this stove had no problems and the wind guards kept the flame burning. Another reviewer calls this a “great little camp stove”. She mentions that the product is easy to get set up and simple to use. The basic, low-tech features are what she likes about it, as a camp stove should be simple. She mentions it does everything you need to do and uses very little propane fuel even when cooking several hot meals a day for a few people. If you’re in the market for a solidly made, affordable basic camp stove without a lot of bells and whistles, you’ve come to the right place. The Coleman Classic Propane Stove offers easy-to-use cooking while you’re out in the middle of nowhere tent camping, or having a tailgate party with friends. Two burners with fuel-saving technology allow you to feed hungry hikers, then easily pack it away and move on without a hitch. Coleman has been a leader in camp stove and camping gear products for many years and they don’t disappoint now. A variety of reviewers from different walks of life recommend this camp stove—and we can’t blame them! We even have a story written out for you about how this camp stove might not save your life – but it could save a friendship. This post was created for the purpose of exhibiting the various link types available with AmaLinks Pro. All links in this post that lead to Amazon are affiliate links that were easily created and inserted using AmaLinks Pro. Want to see exactly how it works? Take a look at one of the videos on our demo page to see how easy, fast, and fun this is with AmaLinks Pro!